CCAFS research in 2014 focused on key issues facing climate change, agriculture and food security. From facilitating knowledge sharing between nations to generating new data through charting agricultural land, and using mobile phones and other IT to put climate services into farmers hands. 2014 was the year of climate-smart agriculture and the year that confirmed 'information is power'. Here are some of our most popular stories from the year. Let’s travel back in time to January 2014, where Dr. Navin Ramankutty, Associate Professor from McGill University, takes us from South America to Southeast Asia in his blog, Charting the agricultural land of South America. The CGIAR Research Program on Climate Change Agriculture and Food Security (CCAFS) supported Dr. Ramankutty and his research team to collect new agricultural data on the total area of cropland or pasture for Latin America and Southeast Asia for the GEOSHARE project. Researchers collected data using censuses and surveys for different countries of the world, broken down by various administrative units within the countries. For South America, Dr. Ramankutty's team retrieved data for over 7000 administrative units, as seen in the above image. Improved information on where and how we grow our food is fundamental for finding solutions for how to feed the 800 million undernourished people on our planet today and the additional 2-3 billion to be added within the next 40 years. Continuing our journey through 2014, we learned How village shopkeepers spread the word on climate-smart agriculture in South Asia. Travel to a small village in Bihar, where in March, CCAFS in collaboration with ViDocs educated farmers through short videos on climate-smart agriculture practices. The videos are an important communication tool that highlight CCAFS work on climate-smart villages (CSVs). April 2015 brought a new report from the Intergovernmental Panel on Climate Change (IPCC). 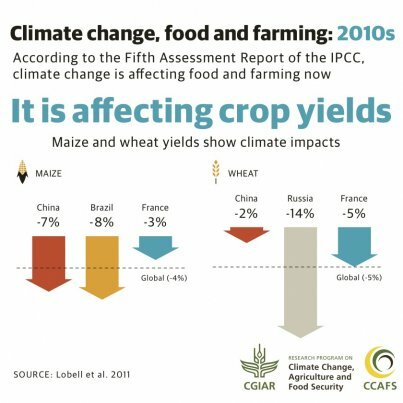 So what do the new IPCC reports spell for the future of agriculture and food security? Experts shared perspectives and opportunities at two major events co-hosted by CCAFS and partners. The adaptation event, held in London on 3 April, focused on agriculture growth, jobs, food security and climate. Read a full summary and watch event footage online and download the summary analysis by Sonja Vermeulen. The mitigation event, held in Washington DC on 16 April, identified actionable opportunities for reducing agricultural greenhouse gas emissions and increasing farmers' food security and resilience to climate change. Read a full summary with video footage and download an info note on low-emissions rice production in Vietnam. CCAFS researchers and CCAFS research, appeared in several media outlets including the Guardian (link 1, link 2), Forbes.com, Deutsche Welle, the Hindu Business Line, Thomson-Reuters foundation, Public Radio International, and Xinhua News Agency. In May, a large Senegalese delegation consisting of members of the Ministry of Agriculture, the Presidential Council, the Parliament, local authorities, the meteorological agency of Senegal, research centers, extension services, as well as farmers, made a 24-hour journey from the capital Dakar to Colombia in South America. This visit, organized by CCAFS, was in effort to strengthen the cooperation between Senegal and Colombia, both of which are facing similar challenges on issues such as climate variability, agriculture, and the challenge of feeding the growing population. In June we saw exciting developments around the meeting of the UN Framework Convention on Climate change (UNFCCC) Subsidiary Body for Scientific and Technological Advice (SBSTA 40) held on 30th in Bonn, Germany. There, parties to the UNFCCC finally made progress on issues related to agriculture. As well, delegates from 25 African countries engaged in a dialogue on a shared vision and a mechanism for coordinating country efforts for climate-smart agriculture. The blog story A Climate-Smart Agriculture Alliance for Africa provides a brief summary of the discussions that took place and reinforces the importance of the Climate-Smart African Alliance, aimed at triggering policy changes and increasing investments that can transform Africa’s agriculture in a changing climate. In August, a new CCAFS report found that conservation agriculture can improve some farmers' livelihoods and resilience, but it may not work for all smallholder farmers in Africa. The Meta-analysis of crop responses to conservation agriculture in Sub-Saharan Africa looked at 41 studies of various agro-ecologies and climate conditions of Sub-Saharan agriculture. The study aims to solidify an understanding of what conditions result in positive crop responses to conservation agriculture (CA) practices as well as identify the factors that limit the adoption and impact of CA and potential solutions to address these. These issues are explored in the blog story, Does conservation agriculture work for smallholder farmers in Africa? New report highlights key points for action, which asks, to what extent could smallholder farmers in Sub-Saharan Africa benefit from CA, and in which conditions? In September we discovered a new type of researcher, in the blog story, CGIAR Knowledge driving changing practices among rural farmers in East Africa. Like contemporary scientists, these new researchers are curious about new knowledge and yearn to find solutions to their local problems. These are smallholder farmers who work closely in neighborhoods. Together, they champion new crops and tend to new livestock breeds that will transform the ability of their communities to withstand increasing heat and drought resulting from variable seasonal rainfall. Through innovative partnerships that include CCAFS, development organizations, policy makers and national agricultural research stations, they operate in testing and learning sites referred to as climate-smart villages (CSVs). Our next stop brings us to the International Day of Rural Women, October 15th, 2014, the day that saw CCAFS launch a toolbox to support the integration of gender and social perspectives in climate research and program development, launched via la live stream event in Nairobi, Kenya, summarized in the blog, New toolbox for genderand inclusion in climate change projects. The Gender and Inclusion Toolbox: Participatory Research in Climate Change and Agriculture (PDF) is the result of a long-term partnership between CCAFS, World Agroforestry Centre (ICRAF) and CARE International. Towards the end of October our travels take us to Bangkok, Thailand, where efforts were launched to bring significant reductions in greenhouse gas emissions from rice cultivation — the second largest source of methane generated by agriculture globally — while making production more efficient and resilient to weather-related shocks in three rice-producing countries in Asia and Latin America. Ongoing work at CIAT's headquarters in Colombia, to measure the greenhouse gas emissions of rice production. The International Rice Research Institute (IRRI), the leader of the project, the International Center for Tropical Agriculture (CIAT), and CCAFS are working together with rice farmers, policy makers, and an array of other partners in Vietnam and Bangladesh, two of Asia’s largest rice producers, and Colombia, the country with the second largest rice area in Latin America. The work is part of the Agriculture Initiative of the Climate and Clean Air Coalition to Reduce Short-Lived Climate Pollutants (CCAC), which is led by nine CCAC partners: Bangladesh, Canada, the European Commission, Ghana, Japan, Nigeria, the United States, the World Bank, and the U.N. Food and Agriculture Organization (FAO). November reminds us once again of the importance of climate information services. The blog story, In a changing climate, information is power, defines climate information services as powerful tools that can help farmers adapt to the impacts of climate variability and change, to both protect them against drought and extreme events and take advantage of good conditions. This infographic (click to enlarge) highlights what kind of information is being provided to farmers, and how it expands the range of management options available. Agriculture was not on the official agenda at the United Nations Climate Change conference (COP20) which just wrapped up in Lima, Peru (read our full analysis here), but it was still a hot topic. CCAFS and partners were in Lima to share experiences and insights on agriculture and food security. Activities ranged from a Hackathon, official UNFCCC side events including one with the Government of Kenya, sessions at the Global Landscapes Forum, and half a dozen seminars with farmers, youth, civil society and policy makers. Read the report back from COP20. What does 2015 have in store? We look forward to 2015, which is probably one of the most important in the decade for global climate change policy. Lets make agriculture, fish, livestock forests, diets, and food waste highly visible in the debates leading to the UN Climate Talks in Paris in 2015! Imogen Stuart is a student assistant at the CCAFS Coordinating Unit focusing on communications, social media and web content management.